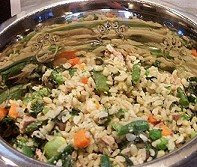 A lot of true animal lovers prefer and take a lot of pleasure from cooking special meals for their pets. Some pet owners do that because they do not trust commercially prepared pet foods, some want to avoid possible medical conditions and health consequences, such as various allergies, digestive disorders, weight gain, etc., and some just want to make their pets happy. That is why they gladly spend their time and efforts for cooking quite complicated meals for their pets (like Lasagna or Meat Cakes), and as a reward they receive great love and joy of their little friends. Nowadays, there is an abundance of the recipes for homemade pet food, as well as various dietary and nutritional recommendations for pet owners, who want to cook for their animals. Moreover, cooking meals for pets is advised by many modern specialists, because homemade pet food is an opportunity for many pet owners to provide their pets with something more balanced, healthy and useful than commercial pet foods, which are always filled with harmful chemicals, additives, indigestible fillers, preservatives and other elements, which should not be included to a pet's diet. Undoubtedly, a pet diet formulation is a prerogative of only experienced veterinaries or pet nutritional consultants, and it can be extremely dangerous and harmful to use any of randomly selected recipes for your homemade pet food. Now, there are thousands of pages in Internet written by pet owners who cook homemade meals for their animals and want to share the recipes with everyone. But how do you know that this particular type of homemade food will be good for your little friend?